Snelling Staffing Services is a full-service staffing agency serving temporary, contract and direct-hire needs for employers throughout the United States and Puerto Rico. Snelling runs its business through franchises that are individually owned and operated. Snelling was founded in 1951 and is currently headquartered in Dallas, TX with a network of over 110 offices. AppFoundation is a professional services firm that provides custom web, mobile, and desktop application development. We leverage innovative technologies to deliver premium user experience that engages customers to drive satisfaction, brand awareness, and deliver measurable results. Snelling asked AppFoundation to lead a large project to re-invent their website for franchise offices, candidates, and employers. The goal of this project is to deliver a multi-site website for Snelling that delivers a single configurable content management system to govern website/micro sites setup and production for Snelling. 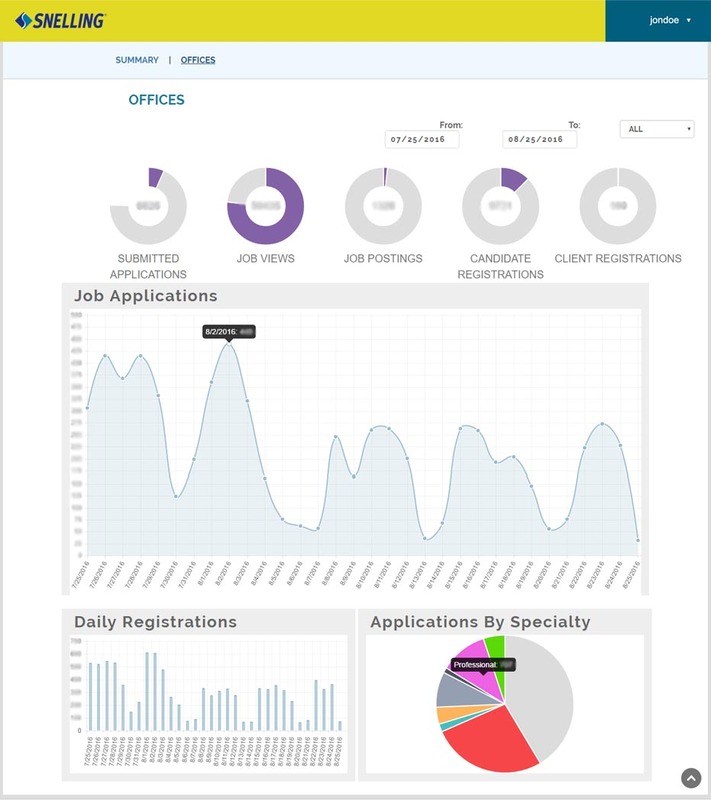 The new site will be integrated into the existing EmpACT job board software via Entake API. The Entake API will be enhanced by the creation of a set of RESTful services to act as a gateway into job board features. The EmpACT and new Wordpress multi-site environment will be created and hosted on Cloud based infrastructure. Executed a full repositioning effort for the Snelling Staffing brand. We created new user experience, updated their CMS, added new channels to increase customer experience, added digital engagement analytics engine, and moved infrastructure to a cloud solution. Digital Transformation was the driving force behind this project to better connect legacy systems with a more modern API so that business processes and services can be pushed to consumers via new digital channels. The genesis of the marketing plan is the business planning sessions conducted with the executive leadership team. During that sessions a three-year, high-level marketing plan was developed laying out goals, strategies and plans for the coming three years. The core of the plan revolves around the Vision and Mission statement. The plan has been developed to see the vision of Snelling become reality. In order to bring the company’s vision into reality we worked with Snelling to develop new skills and new ways of thinking. It was decided as part of the three-year marketing plan to establish “specialty talent services” as a new market category within the staffing industry and then claim dominance in that category. 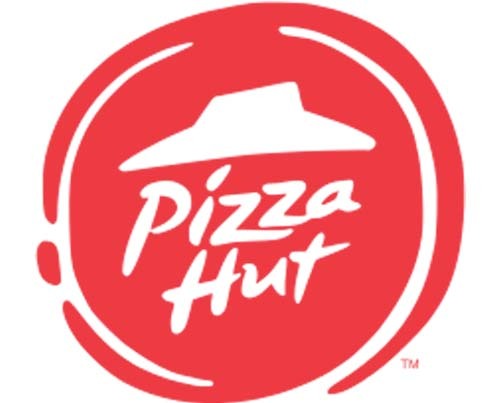 In support of efforts to realize the vision of the company, a brand strategy was developed and “socialized” among half a dozen offices to test if the brand can be implemented and supported by all employees (corporate and franchisee). With a few minor exceptions, the brand strategy was seen as a very positive way forward to help with overall marketing efforts. Achieving the vision and implementing the brand are driving the initiatives in the marketing plan. Corporate America is at a critical juncture. To sustain recent hard-won gains in global productivity, companies must have a talented, innovative and highly skilled workforce to not only sustain their market share, but expand and increase their revenues. In today’s fiercely competitive climate, this is no easy feat. HR and senior executives have spent many sleepless nights worrying about finding, attracting and retaining great people. While every employment agency promotes itself as a “client partner” with great expertise in finding “passive candidates” who fit the organization’s requisites, these claims are often vague at best. The current website did not reflect the new brand of the company or address the current needs of business development resources in the Snelling offices around the country. 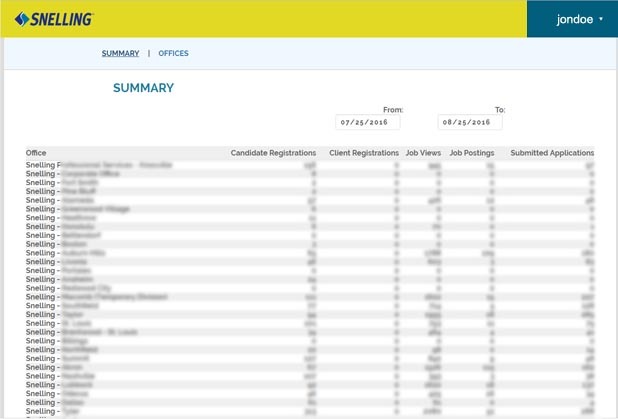 More can be done to help Snelling recruiters and staffing managers find the right candidates, and more can be done to leverage key search terms to ensure Snelling will be found high in the search rankings. The Snelling website was redesigned to meet the current needs of the company, launch our new brand and drive more revenue. Content writing was an important component of the Snelling website, publications, white papers, eBooks and the like. The technology was designed to work well with the new branding and Ux design. The website was built in two parts. The first was the WordPress Multisite core with standard web pages and the second was an Angular JS application built as part of the main site. The Angular portion of the site is apparent when you log in to the site. We transfer the user over to the app portion of the site at that point. • Gets job information from EmpACT via new RESTful API. 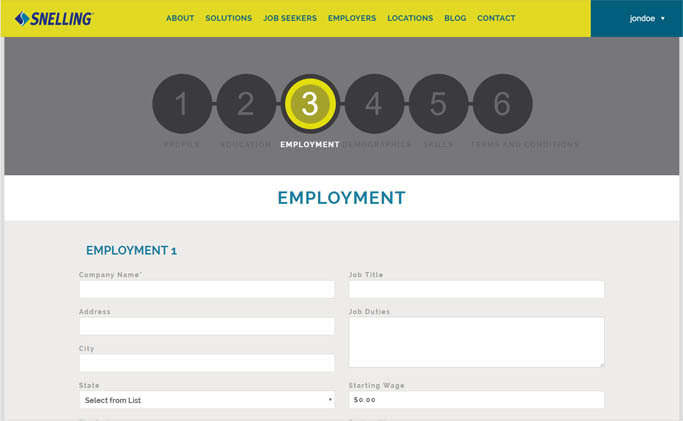 • The Job Board Web UI is a portal within the WordPress site which communicates with EmpACT over REST. This was developed using Angular technology in a responsive format. 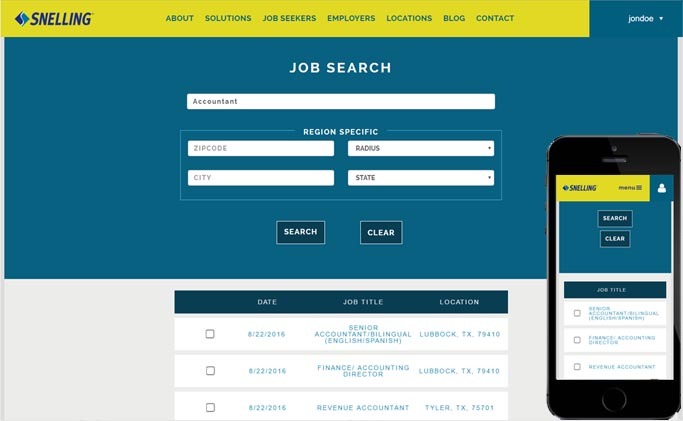 Job Search – Allows user to search for jobs across the Snelling network with full responsive design. 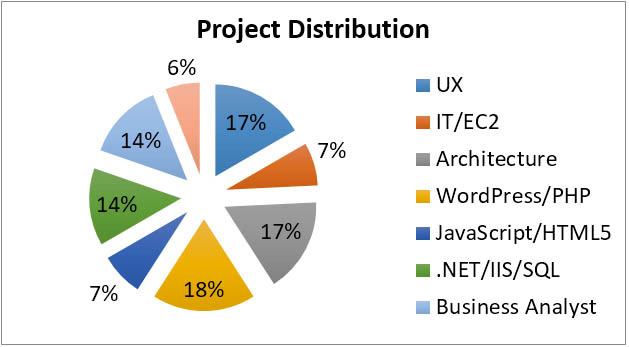 Job View – This is an example of what the user see from selecting a job in the above screenshot from job search. 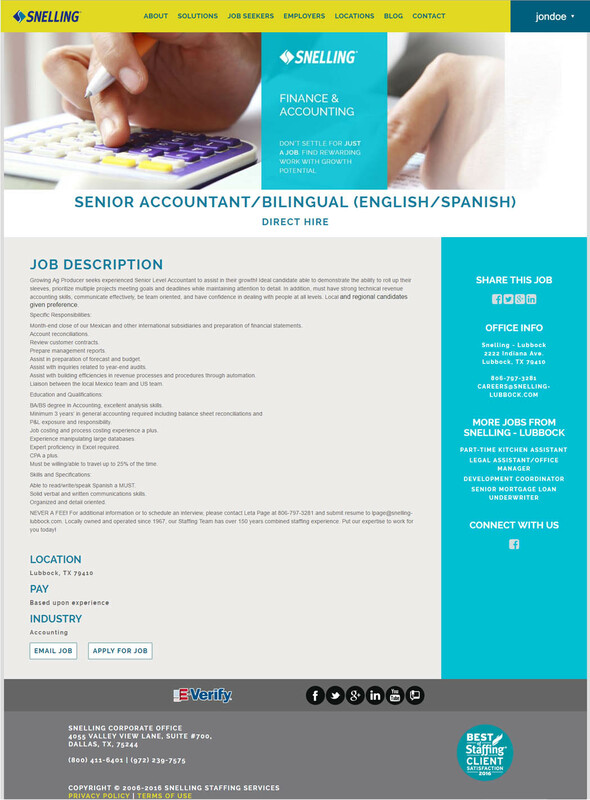 User Resume: Employment – After a user has signed up for Snelling staffing services, they can fill out their online resume to apply for jobs through the Snelling network. 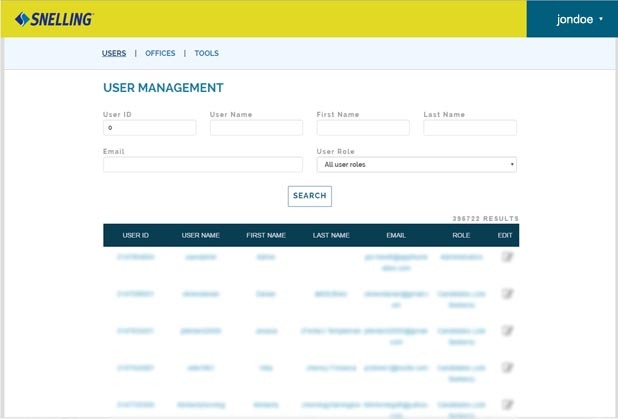 User Admin Tools – Along with the engagement dashboard, AppFoundation delivered a user admin tool to quickly manage Offices, Users, and technical tools. We encourage you to head over to Snelling Staffing to see the work first hand or find a new opportunity through today.